David Clemons, an entrepreneur within the enterprise mobile and online training industry, and Michael Kroth, an expert and author on how leaders can create highly motivating work environments, together deliver rock-solid guidance on the essentials for building, leading, and sustaining a highly productive virtual workforce. Clemons and Kroth present the real-life relationships between managers and employees through interviews of thought leaders and executives that will engage your thinking about how the right leadership, combined with technology, can make all the difference. "This year, the International Data Corporation (IDC) has estimated that the mobile workforce will exceed 1 billion people. The reasons that businesses are moving in this direction vary – everything from cost savings and reducing the carbon footprint to attracting and retaining the top talent necessary to remain competitive. One thing is certain: a mobile workforce is not about technology hardware. Yes, employees need phones and computers. But managing a mobile workforce takes a different mindset and skillset. Managing the Mobile Workforce is a comprehensive look at just that, managing remote workers. While the statistics about the mobile workforce are getting bigger all the time, the book does offer a realistic overview into the statistics surrounding this new type of worker. In addition, it not only outlines the reasons for developing a mobile workforce strategy, but Managing the Mobile Workforce takes you through the key components to consider in developing the strategy. The book is filled with real business case studies, from companies like LEGO, Citrix and Hewlett-Packard, detailing how they are creating highly effective mobile workforces. For human resources professionals, the sections of the book on hiring, performance management and professional development are particularly interesting. The authors suggest integrating both practical and creative approaches to managing mobile workers. For example, one chapter of the book is devoted to taking motivational principles we are currently familiar with and applying them in the context of mobile workers. A real takeaway in the book are the places where you get a taste of what mobile communication is like using what the authors call a series of “freemiums”. Each chapter offers the opportunity to text a code into your mobile phone and experience first-hand some of the information available to mobile workers. For individuals or companies looking to the future, this book offers an overview of how to incorporate mobile into your talent strategy." -- Reviewed by Sharlyn Lauby, SPHR, CPLP of ITM Group, Inc.
They’re always available. They might work from home, from the road or from your organization’s different offices. They rely on the right hardware and software and have management’s support for their far-flung working ways. They are the mobile workforce, and their mobility is tied not only to where they are (or aren’t) but also to their use of technology and the way they, and their managers, think. But how do managers hire, lead and support this workforce? How do executives factor this workforce into decisions about the organization’s strategy and competitiveness? Managing the Mobile Workforce doesn’t try to identify the latest technologies. Instead, it focuses on how to create “a trusted, supportive work environment for employees” and build commitment among teammates who may see each other rarely, if at all. Throughout the book, readers get access to additional, free content they can access on mobile devices. Developing a mobile workforce strategy.Evaluate whether your organization is a good candidate for a mobile work environment and what the benefits and costs of a mobile workforce truly are. Learn about different types of mobile technology platforms and how they can be integrated with your current business systems. 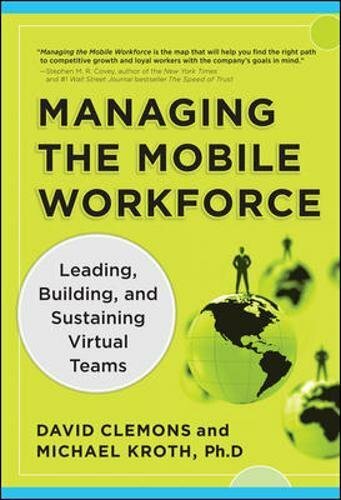 Learning what a mobile workforce is—and what it isn’t.Authors David Clemons and Michael Kroth debunk ideas about the mobile workforce. Working away from the office will help, not harm, employees’ careers, they argue, and allowing employees mobility will help employers. They show how mobile technology affects not just where work is done but how it gets done. They also argue that workers and the products of their work don’t have to be in the same physical space. Creating presence. For the mobile workforce, being present isn’t about physical proximity. Presence means the feeling that someone or something is close by, and technology can create real social presence among employees and between them and managers. That presence is the bedrock of trust and motivation, the authors say. Building trust.Readers learn specific techniques for building trust among team members via technology. Sticking to regularly scheduled business reviews and performance evaluations becomes more important when team members are apart, and because it’s harder to observe behavior for mobile employees, giving and getting feedback becomes even more vital. Tips cover creating personal connections among mobile workers and managers, dealing with conflict, and providing regular forums for discussions. Leading in a virtual environment.Managers and other leaders can learn to analyze their organizations’ mobile readiness and fit the idea of telework into the bigger picture of strategic planning. The book encourages leaders to create a “platform for mobile work” that integrates hardware and software choices with policies and procedures as well as strategic plans and competencies. Managing the mobile workforce’s performance. Readers get a performance management process tailored for mobile workers and including aspects of mobile performance such as whether the available technology is fully supporting the job. Principles for motivating this workforce.Clemons and Kroth offer an eight-point list, from setting challenging goals to demonstrating real care for employees.